From tackling rugged terrain to managing vertical slopes, spider excavators and walking excavators make seemingly challenging projects easier. At Caldme, we provide a selection of all-terrain excavators for hire. At the heart of our fleet is the Menzi Muck excavator, which makes working on complex and sensitive sites easier. As a team that’s been operating spider excavators since 1980, we have an abundance of experience you need to simplify your excavation project. Over the last few decades, we’ve worked with large organisations from a variety of sectors, including government agencies. Walking excavators are the all-terrain vehicle of excavators, letting you dig in any location no matter the condition of the ground be it wet, dry, flat or sloped and rocky. It gets its name from its spiderlike way of movement, all 4 wheels moving independently of each other to achieve a maximum range of motion. Flotation tyres. Every machine in the range is equipped with flotation tyres which allows them to move across delicate sites without compromising your safety or the environment. Flexible undercarriage. Each machine features a flexible undercarriage which makes it possible to navigate coarse obstacles without causing damage to the machine itself. 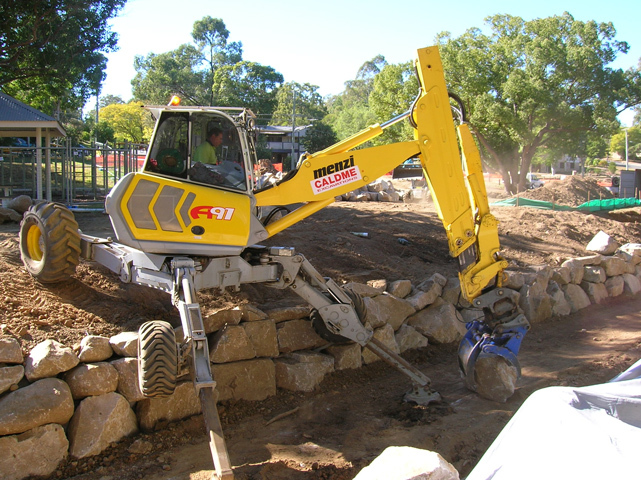 When matched with the right attachments spider excavators can also act as mulchers. Most importantly, hiring an all-terrain excavator means you open yourself up to a robust machine. 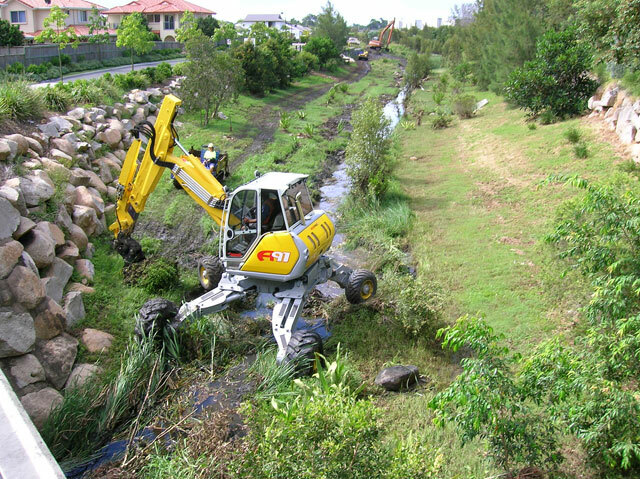 Each piece of plant machinery you hire from us is strong enough to shift large items such as trees and boulders, even if they sit in the middle of a stream. With far-reaching legs and stabilisers that navigate the rockiest of sites, our spider excavators won’t disappoint you. Whether you hire the Menzi Muck or another excavator from our range, you can use them for marine construction and river restoration without worrying about disruptions to your project. By striving to keep a low-age profile throughout our fleet, we defeat challenges such as breakdowns. With fewer breakdowns, your efforts become more cost-effective. At Caldme, we pride ourselves on delivering excellent customer service, even when you need to navigate tight spots that conventional machines struggle to reach. With most of our team members possessing 15 years of experience in the industry, you can come to us for reliable advice that helps you sail through your plans. Caldme is a family-run business that makes customer service the cornerstone of the team’s experience. Working with construction site and project managers across the major areas of QLD, NSW, VIC, and WA including Brisbane, Cairns, Mackay, Sydney, the Central Coast, Port Macquarie and Melbourne, our team of specialists is here to help you out. If you want to know more about our fleet, contact us. Call us today to receive your free no-obligation quote. Helping you from start to finish.